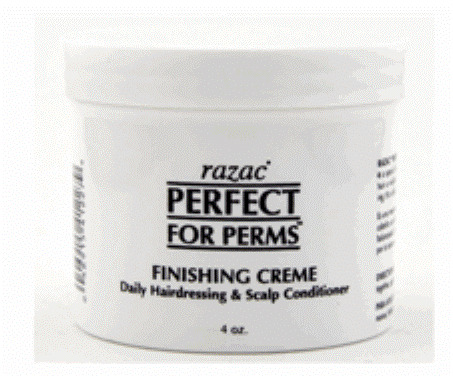 Razac PERFECT FOR PERMS: FINISHING CRÈME (DAILY HAIRDRESSING & SCALP CONDITIONER) **RAZAC PERFECTING FOR PERMS’ FINISHING CRÈME: is a special blend of essential oils and proteins combines to give hair a visible sheen, a healthier look, and balanced conditioning. It’s a daily dressing that’s “light” so not to weigh hair down. DIRECTIONS: place a small amount in palms of hands. Rub hands together; apply to hair, brush thoroughly. Comb to style.